Marble, 40 x 18 x 16 cm. When Herman Wilhelm Bissen left Slesvig to commence studies at the Danish Royal Academy of Art in Copenhagen at the age of 18, it was with the intention of becoming a painter. 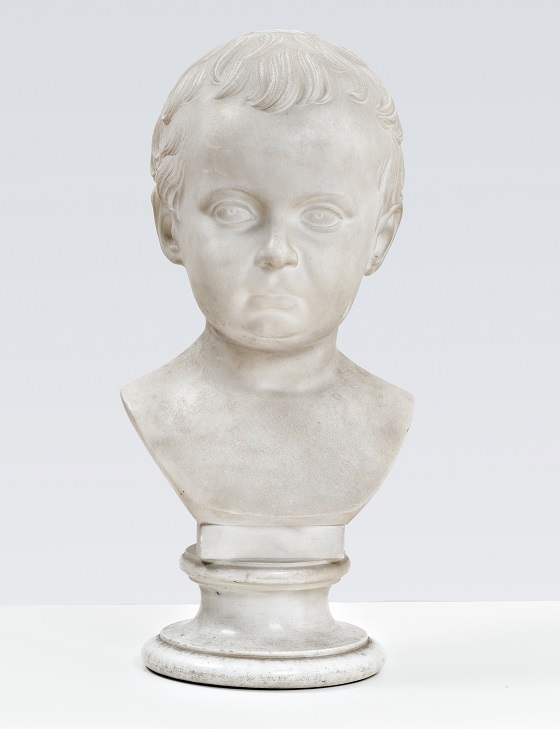 However, it was sculpting that quickly caught his interest instead, and after having triumphed at the academy’s awarding of medals, Bissen travelled to Rome with the intention of becoming a sculptor. During his time there, he became acquainted with the greatest sculptor of the time, Bertel Thorvaldsen. Bissen would spend his whole life in the shadow of Thorvaldsen’s success, but the two colleagues often worked closely together. Bissen was clearly influenced by Thorvaldsen’s classicist idiom, but in comparison, Bissen’s sculptures often appear more dramatic. Nationalism also left its mark on Bissen’s art, and Bissen found his own style and niche in earnest with subjects such as The Danish soldier from 1850-51.